Why We Need Horse Friends. “You know, no one will ever care about your horse the way that you do.” My friend said it in a testy voice. I’d gotten my first horse since leaving home and she’d heard about nothing but him for the last month. Her support was wearing thin. She missed her friend who cared about art and music and movies. I needed some horse friends fast, before I alienated everyone I knew. Then one day a woman walked into my gallery. I was soldering in my studio in back, and I told her I would be right out. She appeared in the doorway and saw photos of my horse on the wall. Then it happened: “Is this your horse?” She invited me to her barn to meet her horses, and a friendship began. Many years later, the day after I lost a very special gelding, I saw her name on my caller ID. It was years since we boarded together, but she was a horse friend, she knew. I choked out a meager hello, one word more than she got out. There was a brief silence on the other end, then tears before words. I’m proud to say Susan is still my friend, and I’m blessed with other horse friends just like her. Does this ever happen to you? You read some horrific story about horse abuse, or you have a neighbor whose daily neglect wears on your heart, or maybe someone at your barn is really hard on their horse. In that moment, the hurt and anger at your own species can result in an I hate everybody mood. I was in that mood three weeks ago. Leslie and I had gone to see a horse she had previously owned, and I had trained. 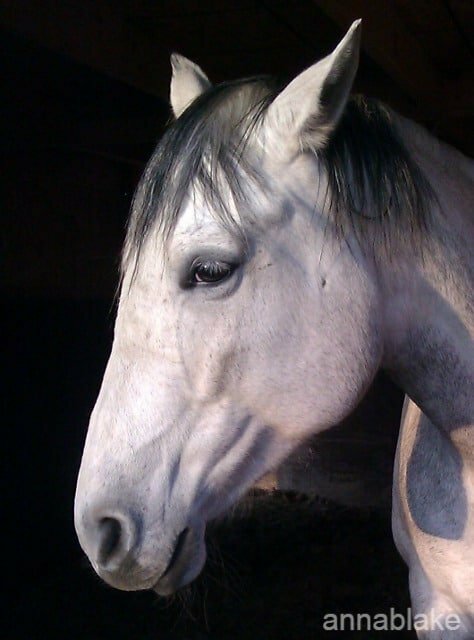 I wrote about him and the Very Thin Line between a well-loved and owned horse and a rescue horse here in my blog, as a way of trying to get past the hard feelings in that transition of bringing Our Boy back home. I am truly humbled, overwhelmed and so grateful for the out pouring of support from so many of you. There were lots of similar stories and such good will shared here, that I know Our Boy feels the impact as well. For crying out loud, some of you even offered to send money to help! My heart swells with pride in my horse friends, a simple thank you doesn’t convey my gratitude at all. Some of you asked for updates (like worrying about your horses aren’t enough!) Our boy is good. His eye is soft again and Edgar Rice Burro is keeping him company. His badly overgrown hooves are trimmed. He has a saddle mark on his back that is actually indented but he gets a massage this week, and with correct work those muscles will return. I’m not sure who I was trying to protect by not using his real name but it’s Namaste. Do you know the word? It is a Buddhist/Hindu salutation, translated to mean my spirit honors yours or the Divine spark in me bows to the Divine spark in you. It’s a great name for a horse, isn’t it? Love this! And so true! Horse friends are so important! Beautiful Anna! Love changes things. In all it’s forms. Hello Anna. I follow your blog. You are my horse friend, even though I don’t have a horse right now. You have helped me get through losing dogs in the past. Right now, you are helping me get through my mother’s ovarian cancer and the exhaustion and hopelessness and endlessness that I feel. Thank you for the update on Namaste. His is a beautiful name, and very fitting. Thank you for the blog about Walter, Walter, Walter and his great run and plastic bag kill. I have Italian Greyhounds, and we have gone lure coursing many times, so I could feel your excitement at watching him do something that comes so naturally to him. It sounds like he is an absolute natural at it, and that is not always so with every dog. My hope is that one day I will be able to contact you, and you will help me learn to ride. I would not want to learn from anyone else. It’s something that I just need to do. It’s almost an ache. I know you will know what I mean. Namaste, what more to say …. so glad you were able to help him Anna!